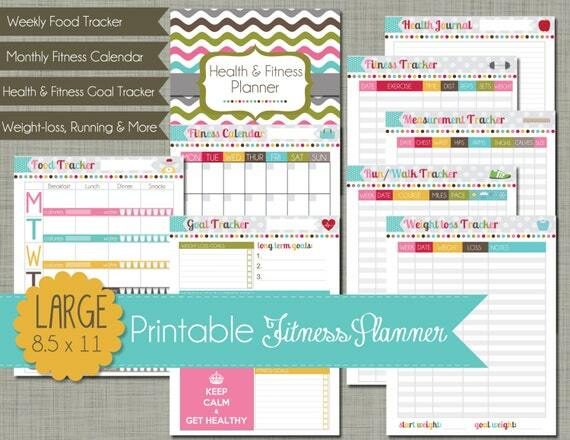 Do you rely on health and fitness planners to keep you on track throughout the year? Planning is key for maintaining a healthy lifestyle and sticking to a fitness and nutrition plan. The daily drudgery of life has a way of taking over and unless you schedule time for making your health and fitness a priority, it all too often is put on the back burner. Managing the details of your daily physical activity and eating habits by using a health and fitness planner is half the battle of living a healthy lifestyle. By setting short and long term goals and planning out your meals and workouts, you will be less likely to skip workouts or binge on unhealthy take-out and vending machine snacks. Plan ahead for success! 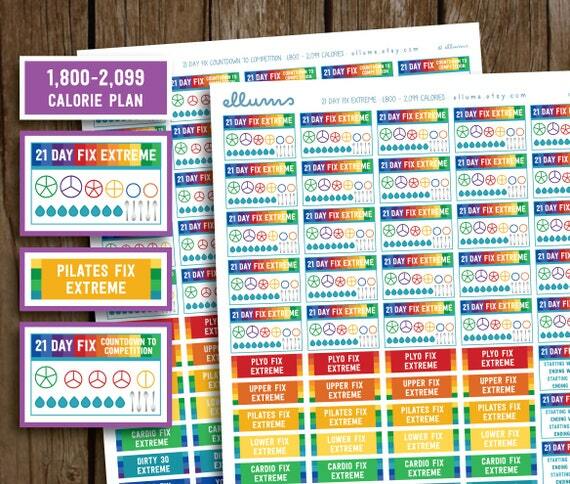 To help you out, I put together a collection of printable health and fitness planners and printable planner stickers that include a wealth of printable resources for tracking your fitness and nutrition goals that are both useful and budget-friendly. Plan it, schedule it and do it! 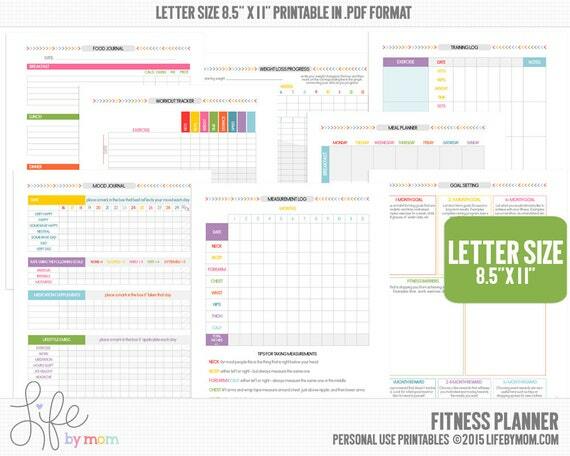 These are do-it-yourself health and fitness planners that you print yourself on a home printer, hole punch and add to a binder. You will receive a pdf file to your email inbox immediately after your payment is processed. No physical product will be shipped. 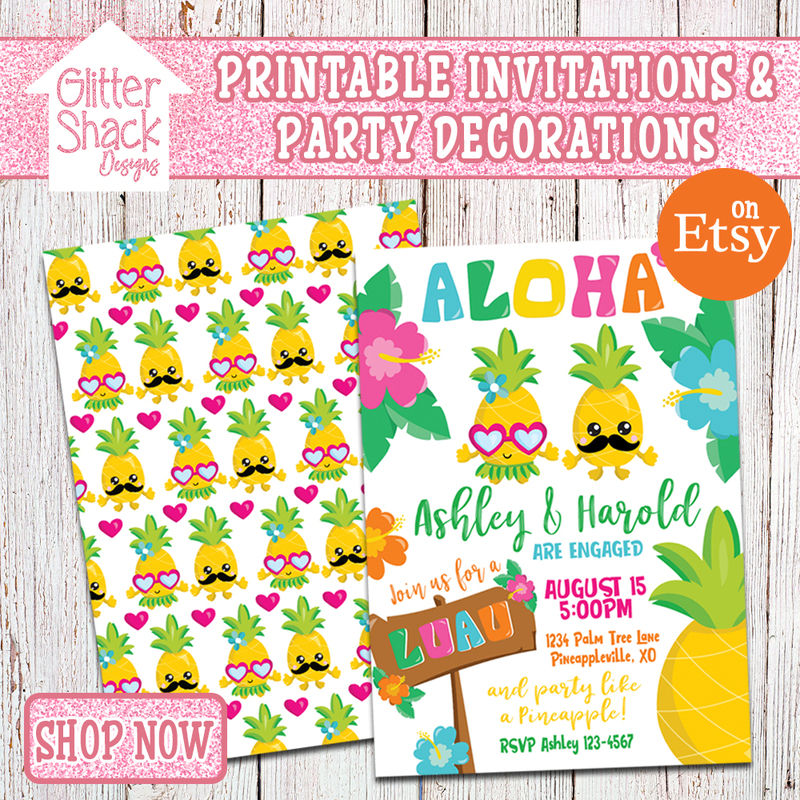 You are paying a graphic designer for the printable template and design. Every planner is different. Pick one that most closely matches your fitness or nutrition goals. Some planners focus on tracking weight loss, calorie counting and cardio where as others track strength training workouts, vitamins and supplements, water intake and strength gains. 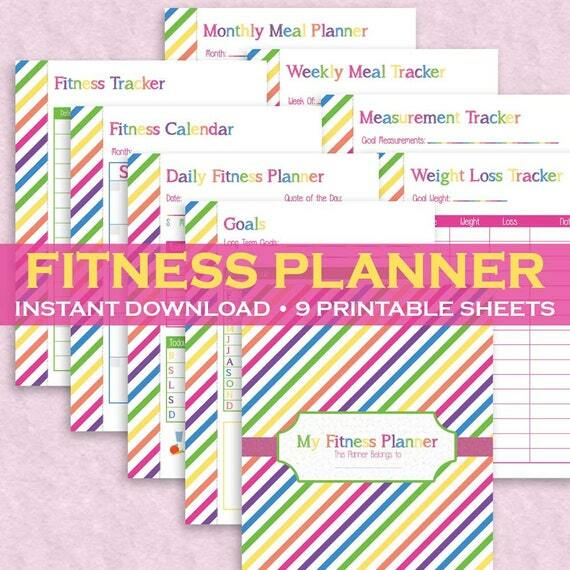 Whatever your fitness and nutrition goals, there is a health and fitness planner for everyone. 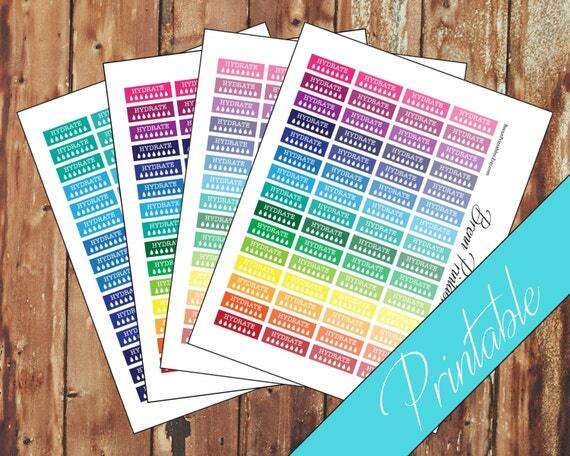 Some sheets are meant to be printed daily and others weekly or monthly. 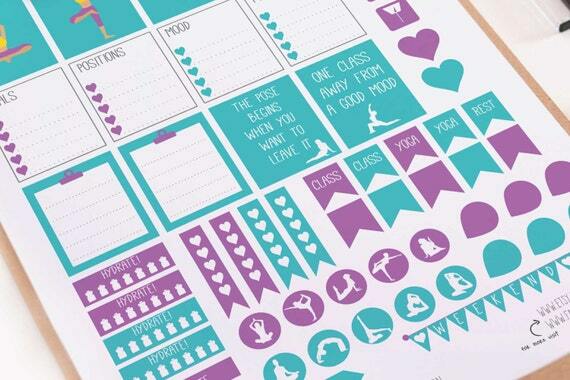 One of the things I love most about using a printable health and fitness planner versus a generic one from the store is I can customize it anyway I like. If there is a sheet that is not relevant to me, I can just skip printing it instead of having a bunch of embedded empty pages that are not useful to me. At times, I have used a combination of more than one planner to build a planner customized to my needs. 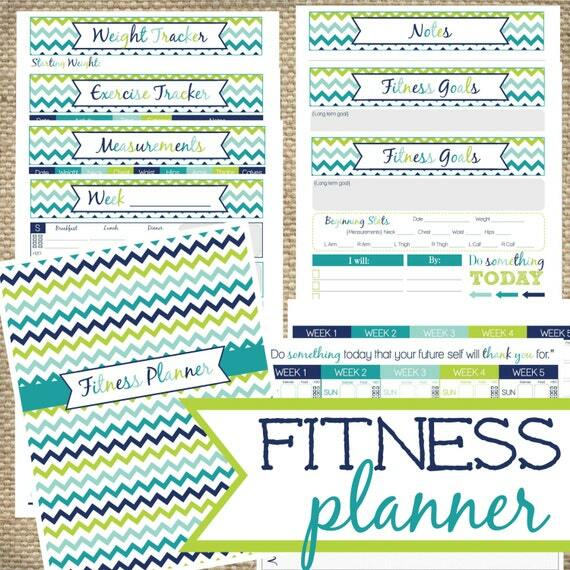 Printables planners are very inexpensive – you could actually purchase 3 or 4 printable health and fitness planners for the same price as purchasing a fitness journal from a book store. 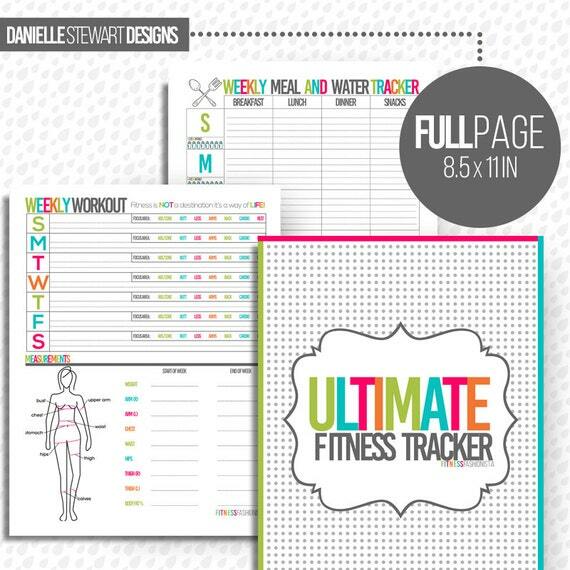 The ultimate fitness tracker package includes a weekly workout schedule, a weekly meal and water tracker, exercise challenge sheets (with illustrations) and a Paleo, clean eating, low carb shopping list to help you keep your fitness and nutrition goals on track. 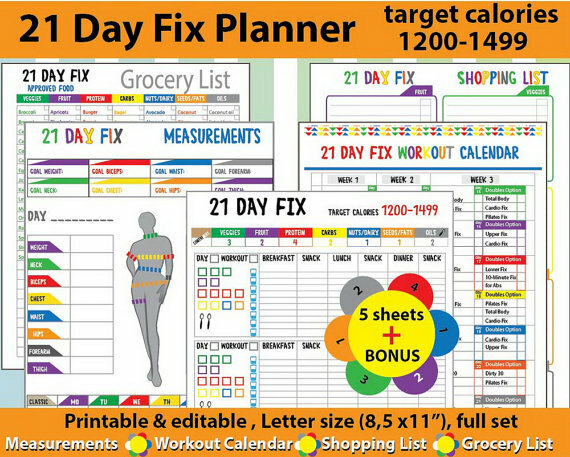 This large fitness planning kit includes 9 printable 8.5 x 11 inch standard sized sheets including a cover sheet, a long term and monthly goal tracker, a weekly food tracker, an undated fitness calendar , a weight loss tracker, a measurement tracker, a fitness tracker, a run and walk tracker and a health journal page. 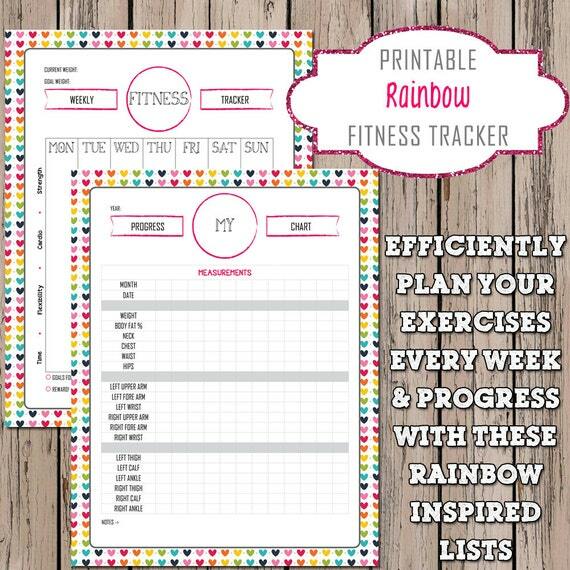 This colorful daily fitness planner has everything you need to stay on track and keep motivated. 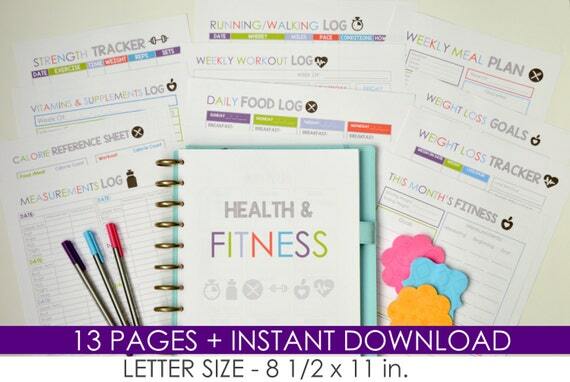 It includes 9 printable sheets for tracking your fitness including a cover page, a goal tracker, a daily fitness planner, a fitness tracker, a fitness calendar, a weight loss tracker, a measurement tracker, a weekly meal planner and a monthly meal planner. Here is a huge weight loss and workout planner that includes 29 printable and editable pages for tracking your fitness and weight loss goals. 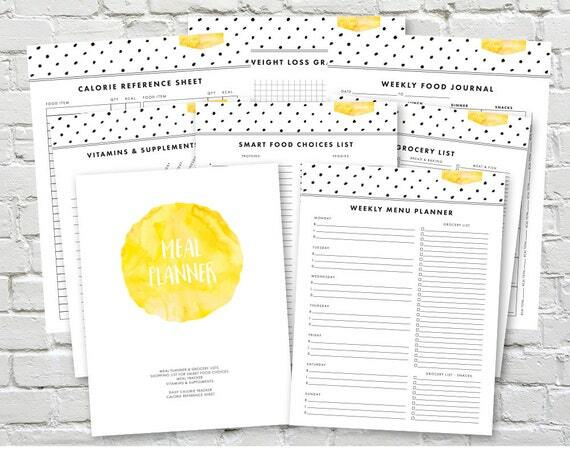 It includes a wealth of planner sheets, everything from grocery lists, meal planners, vitamin and supplement tracking, workout schedules, food tracking, weight loss management to goal planning. Here is a 13-page health and fitness printable planner for tracking cardio, strength training, nutrition and goals. 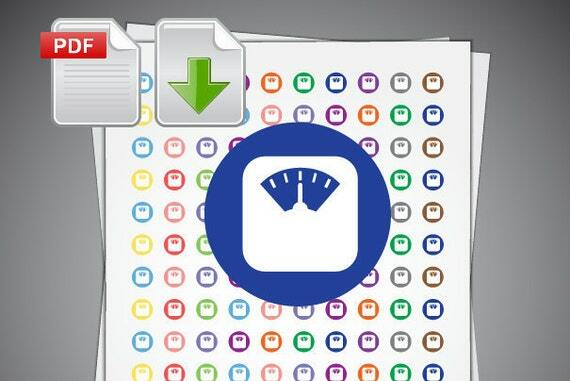 The sheets are editable allowing you to type in the blanks before you print if that is your preference or you can fill the sheets out with a pen. The kit includes a strength tracker, running and walking log, weekly workout log, monthly fitness tracker, weight loss tracker, weight loss goals, measurement log, weekly meal plan, daily food log, vitamin and supplement log, calorie reference sheet, notes and cover sheet. 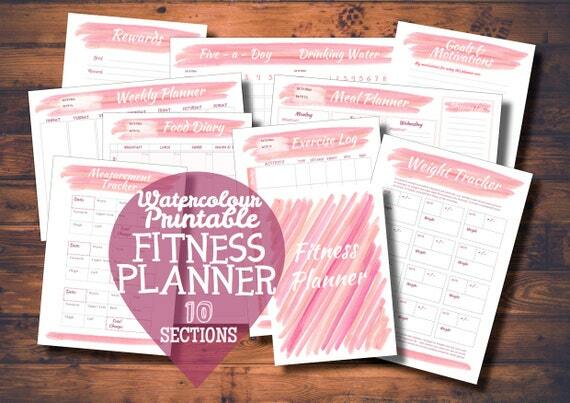 If you are looking for a planner with a fresh, clean design, this stylish, pink watercolor printable fitness planner has everything you need to track your fitness and diet goals. The 10-page planner includes a goals and motivations sheet, weight tracker, measurements tracker, weekly exercise log, weekly food diary, weekly meal planner, weekly five-a-day and water consumption tracker, blank weekly planner sheet, notes page and a targets and rewards sheet. 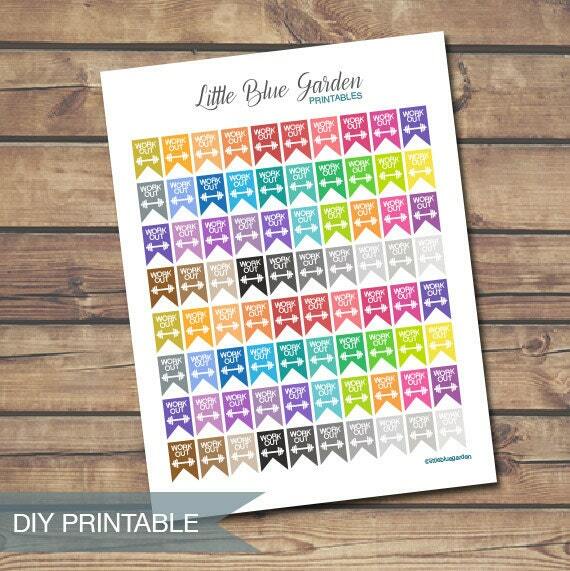 Track your fitness progress with this colorful, blue and green chevron print, printable 10-page fitness planner. 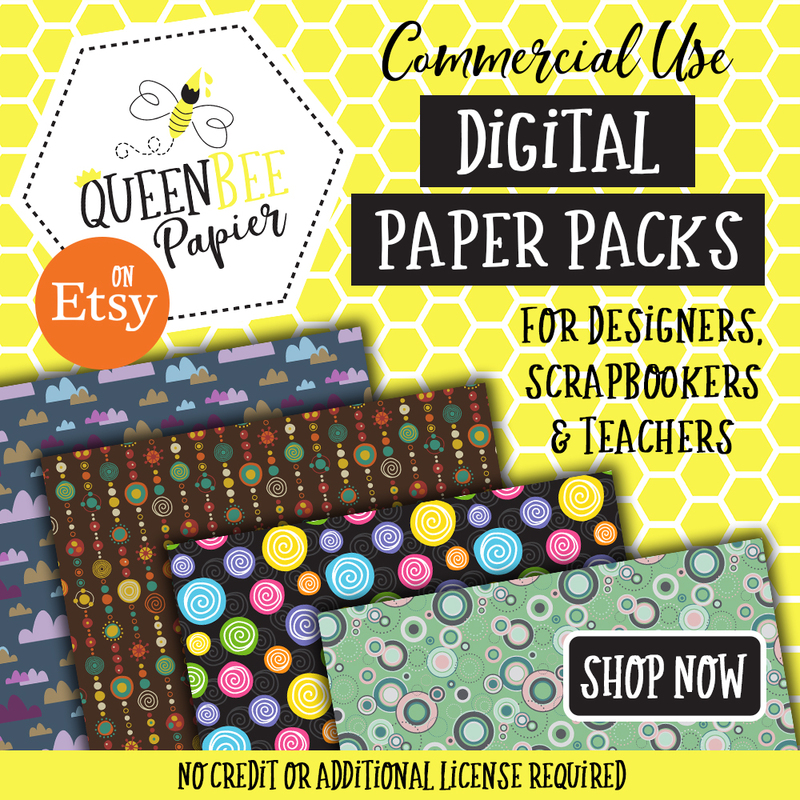 Includes a cover page, a fitness goals worksheet, a weight tracker, a exercise tracker, a measurement tracker, weekly and monthly trackers and a notes sheet. 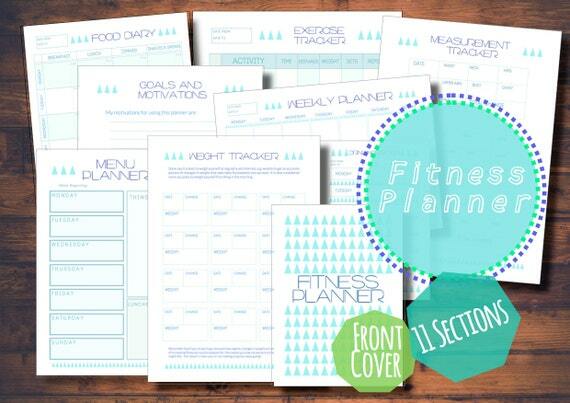 Keep track of your exercise and diet with this clean, modern geometric pattern, 11-page health and fitness planner. The planner includes a goals and motivation sheet, a weight tracker, a measurements tracker, a weekly exercise log, a weekly food diary, a weekly meal planner, a calorie reference chart, a water tracker, a blank tracker, a target and rewards page and a notes page. Track your exercise, nutrition and water intake all on one page with this daily fitness planning sheet. 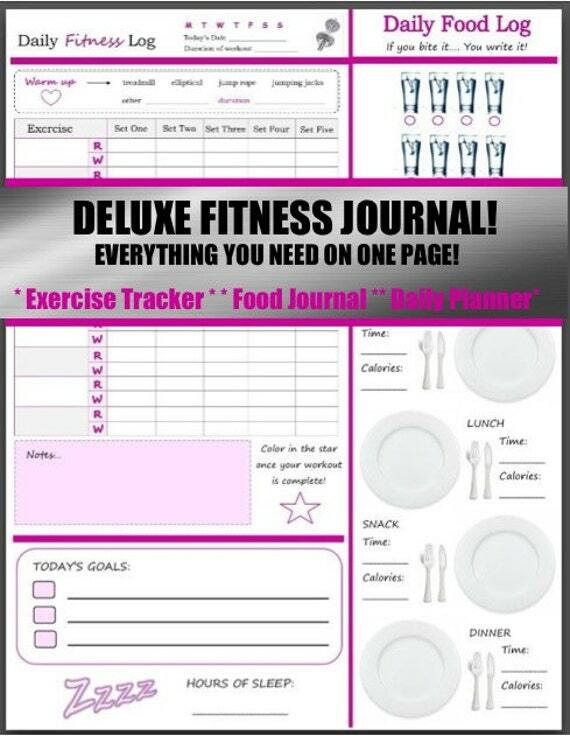 Includes sections for tracking cardio, strength training and water and food intake on one sheet. 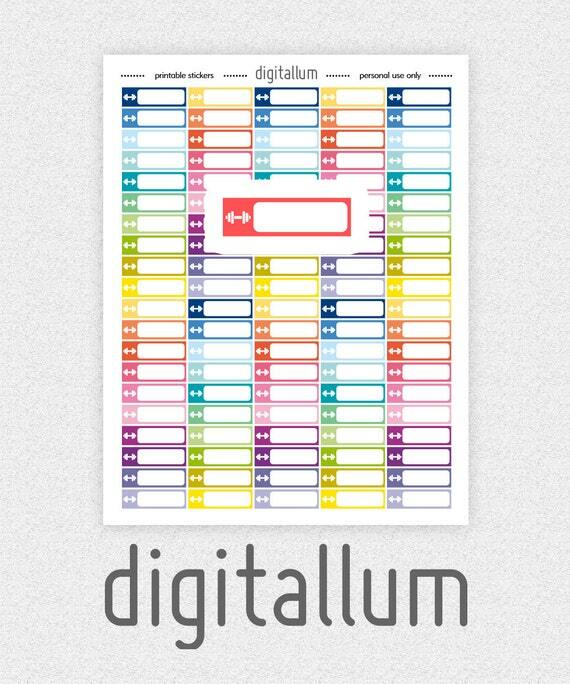 Print a new sheet for each day or laminate it and use a dry-erase marker that can be wiped clean daily. 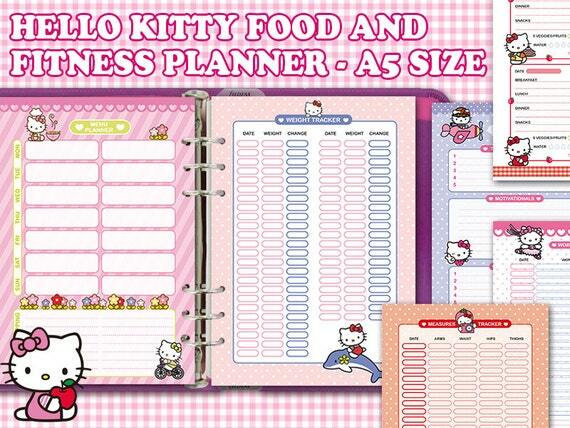 Hello Kitty fans will love this printable planner! 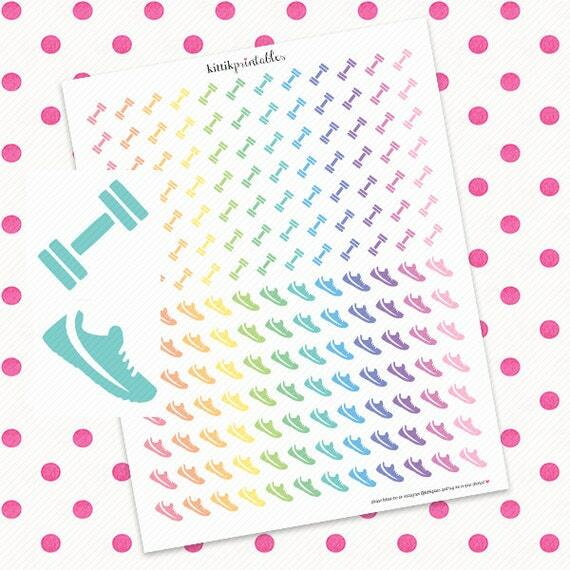 Satisfy your inner geekiness and get fit at the same time with an adorable Hello Kitty fitness planner. The planner includes monthly goals, a menu planner, a shopping list, a food diary, a workout log, a weight tracker and a measures tracker. 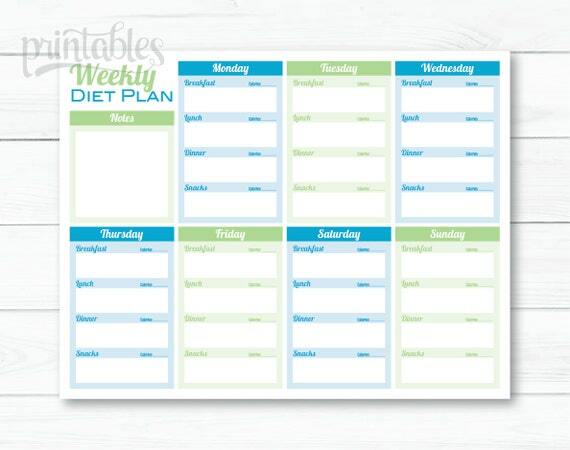 Keep track of your diet, meals and calories with a printable weekly diet planner. You can use this planner to plan your meals ahead of time or you can use it to track your daily progress. You can plan out a whole weeks worth of meals including breakfast, lunch, dinner and snacks all on one handy sheet. There is even a space for notes. 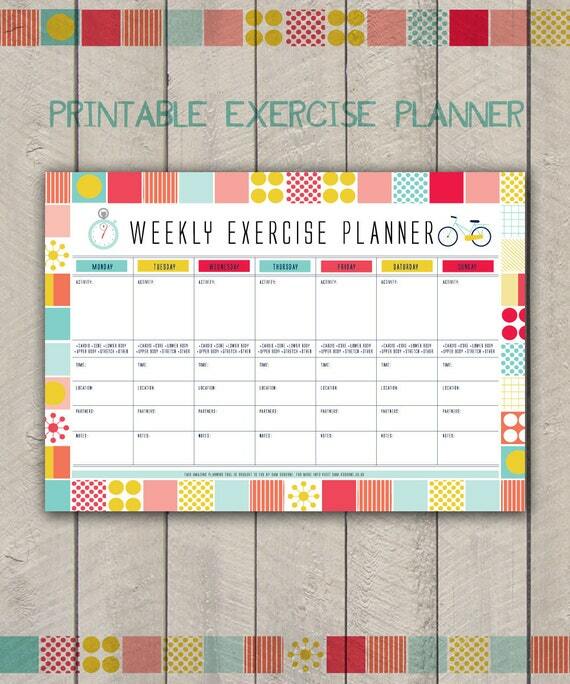 Keep track of your weekly exercise plan with a weekly exercise planner calendar. On this 7-day planner, there is spaces for jotting down the fitness activity you will doing each day, what time, where and with who. There is also room for notes. Change takes time. Old habits need to be broken and new habits need to be formed if you want to create lifelong changes to your lifestyle. 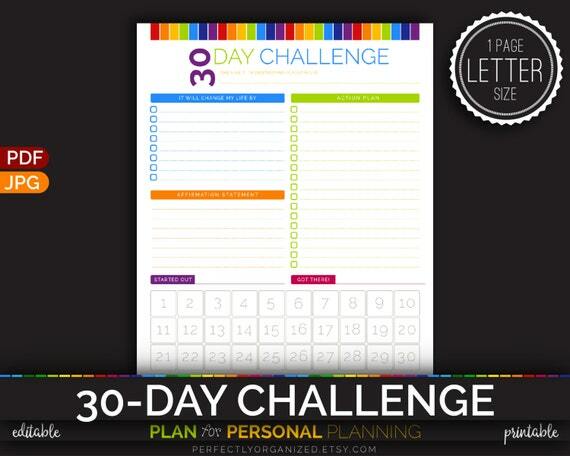 Here is a printable 30 day challenge worksheet for creating a new habit over the period of month. Pick a habit you want to change or begin, write out your goals and action plan and track your progress. By month’s end, you should be well on your way to forming a new habit. 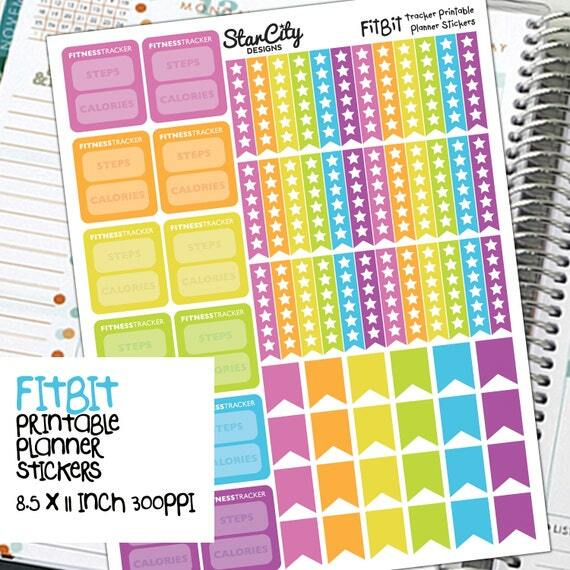 Half the fun of using a planner is filling it with goals, plans, to-do lists and pretty stickers! 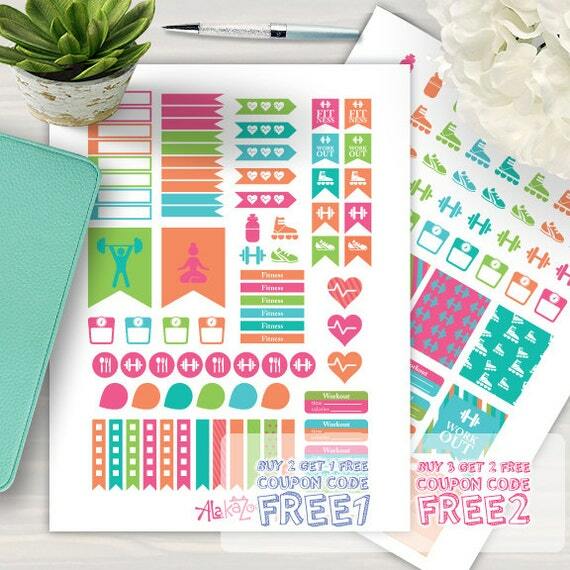 Here are some colorful printable planner stickers that have been designed for using in a variety of planners including Erin Condren life planners. 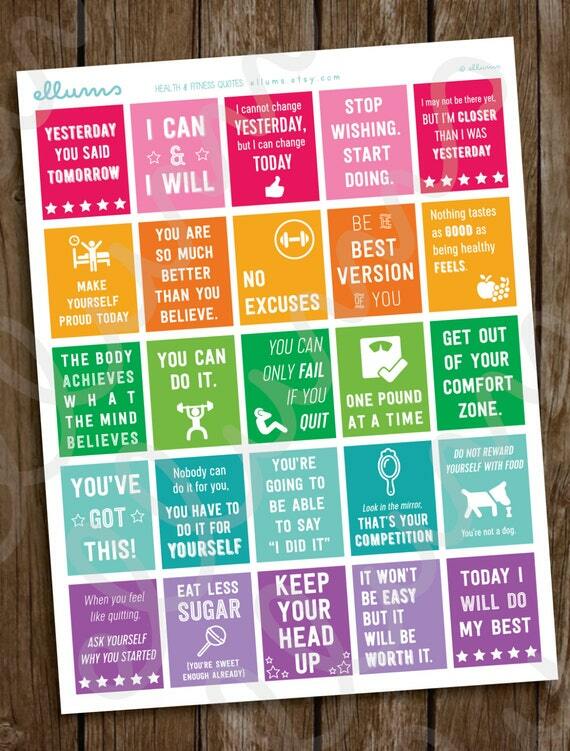 There are stickers available for cardio, strength training, yoga, pilates, walking, running, bicycling, swimming, water intake, tracking weight, motivational quotes and other fitness related activities. 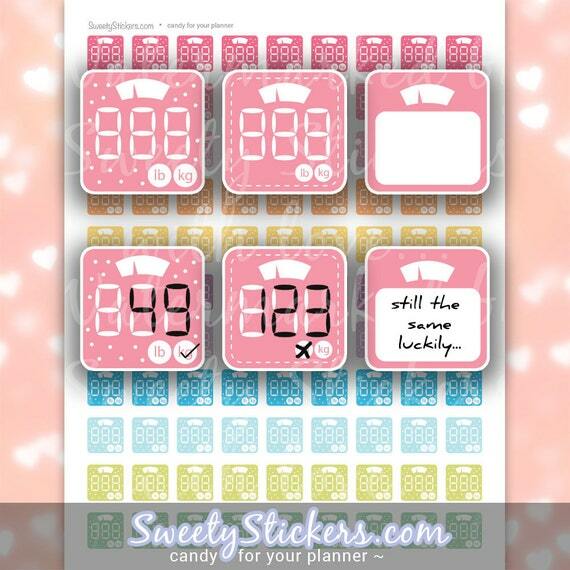 Choose a set of stickers that match your fitness goals. 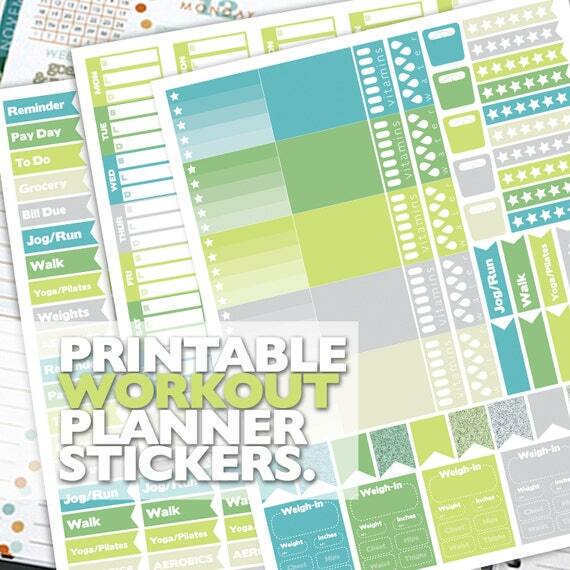 Thank for visiting and I hope you found this selection of printable health and fitness planners and printable planner stickers helpful! 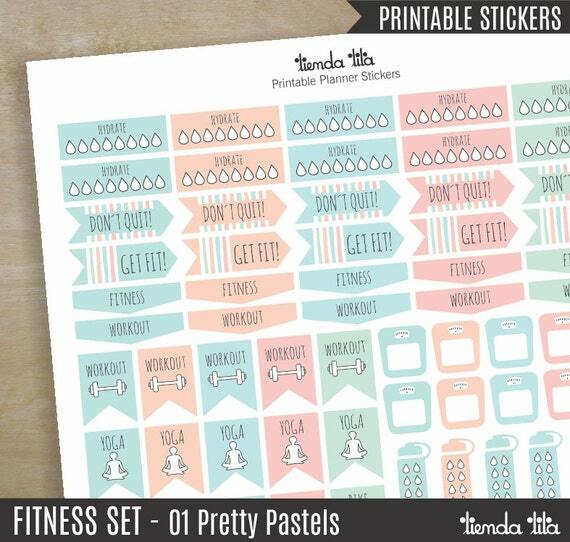 Follow Our Fitness Printables Board On Pinterest For More Inspiration! 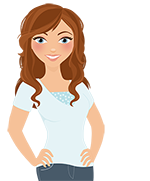 Follow Glitter ‘N’ Spice | Recipes, Printables & Home Decor Ideas’s board Printables: Fitness on Pinterest. 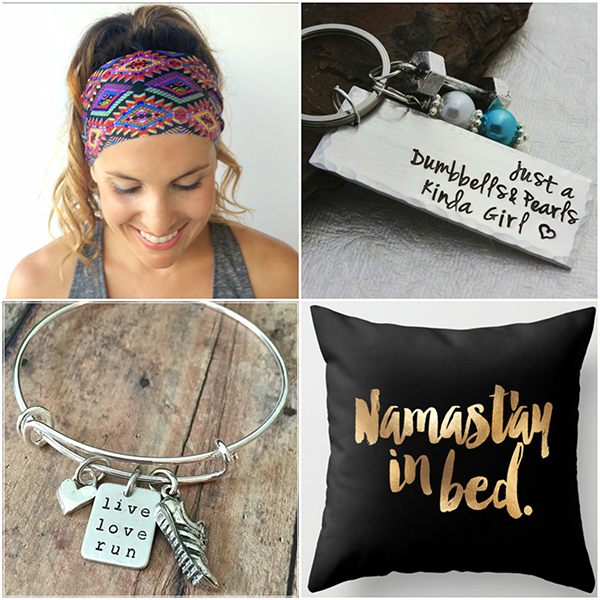 Since You Are Obviously Here Because You Love Fitness, Then You May Enjoy These Inspirational Fitness Gift Ideas For Women Too! If you found this post helpful, please share it with your friends and family on Facebook and Pinterest. Thanks!